Going to be f2p type of mmo. I hope it is kind to my wallet. Sounds good, I loved PSP1, and still trying to finish PSP2. Location : I snuck into your room as you read this sentence. Also, the generic FOcaseal reminds me of Aigis from Persona 3.
how to use dis thing? EDIT: Oh nvm, got it. ._. Still gotta remake my old RAmarl, which is what I'll make next lol.. This game is gonna be addicting. ._. Could you guys show me yer work? wat, can't be dat hard to understand. ._. Oh wells, here's one I made in 10 minutes. Every time I press the randomize everything button I end up with a loli. Race didn't even matter. Every time I press randomize I end up with some obese character lol... likewise race didn't matter.. or gender for that fact. And I'm working on perfecting the "Elisalotte" I'm making.. slowly lol... Dune been busy lately. I press randomise and the majority I get are ugly fat dark skinned characters. Hey, post the character's you're going to use in the game. I'm surprised that there isn't a single post about the benchmark. Don't know what character I'm going to use yet... I wish there were more cast parts, but I guess that come with cash shop. "You can purchase items that affect your character’s appearance, including variations of clothing and accessories and costumes. Only certain areas of the makeup counter will be charged." 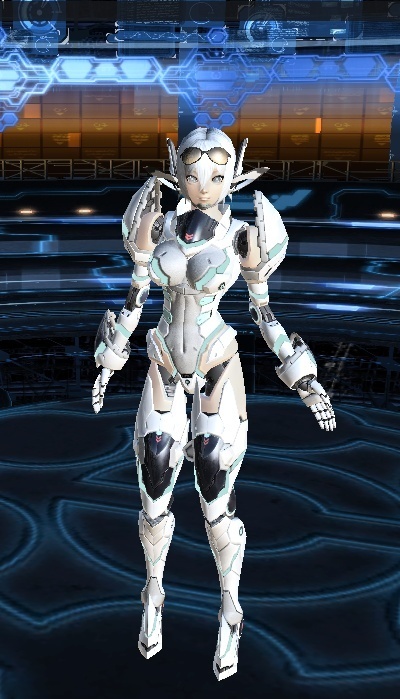 "In the costume shop, they will sell default clothes and parts for meseta." "Arks Cash is needed to use SOME parts of the Makeup Counter, but other areas are available for free."